We have often heard it in recent days. On April 20th, the Yankees were 7 ½ games behind the Boston Red Sox in the AL East after Boston’s blazing 17-2 start at the beginning of the year. The Yankees, then 9-9, were getting ready to embark on the most brutal stretch of their schedule, struggling to stay above .500, with multiple series ahead against division leaders and winning teams. Yet, here we are on May 10th, and the Yankees lead the AL East by one game with the best record in Major League Baseball. I guess I was worried for nothing, thanks to the twenty-five men on the Yankees roster who have contributed to the legendary winning run the team is currently on. Well, make that twenty-four, reliever A.J. Cole has just been along for the ride. It is amazing the last Yankees team to win 17 of 18 games were the 1953 Yankees which included a young Baby Bomber named Mickey Mantle. That’s pretty good company for the 2018 Yankees. I wasn’t alive then but I hear the 1950’s Yankees were pretty good. The Yankees are spoiling second baseman Gleyber Torres. He’s quickly learning losing is unacceptable in the Bronx, having experienced only one loss in his first seventeen games. The Yankees are supposed to win every day, right? Last year, it seemed like the Yankees were consistently losing the close games. Yet, this year, no deficit (it seems) has been too much unless we’re playing the lowly Baltimore Orioles. When Red Sox manager Alex Cora brought his closer, Craig Kimbrel, into last night’s game with five outs to go, it did not feel as intimidating as it had in years past. When Brett Gardner laced the triple to recapture the lead for the Yankees, it wasn’t a surprise to me. It felt like this team was going to find a way to victory. The two run homer by Aaron Judge off Kimbrel was icing on the cake. Loved seeing Astros closer Ken Giles blow the recent game against the Yankees, but watching Kimbrel lose was better even if he didn’t slug himself coming off the mound. This run won’t last forever (will it?) but I am certainly enjoying it while it lasts. Back in early April, I felt we’d have a good litmus test on the Yankees by May 10th. Well, I’d say they aced the exam and have proven they are among the very best in Major League Baseball. Win or lose today, the team’s accomplishments have far exceeded my expectations. Going into the Boston series, I had hoped the Yankees would win at least two of three so that they’d have at least a share of the AL East when the Red Sox headed for the airport. However, with two wins in the bag, let’s “Get Greedy” and go for the sweep! I am not going to get too high. It is only mid-May and there’s so much baseball yet to be played before anything is decided. Gleyber Torres, sadly, will one day learn it is indeed possible to lose two or three games (or…yikes!…more) in a row at the MLB level. I am not going to dismiss the Red Sox. They are a very good team that’s not going away. But then again, neither are we. It should be a great summer of baseball ahead. I did have to check out Boston newspapers today. The Boston Globe featured the Boston Celtics on their Sports page. The Celtics won their Eastern Conference semi-finals matchup against the Philadelphia 76ers and will advance to the Conference Finals against LeBron James and the Cleveland Cavaliers. I suppose that’s big news in Boston but it is funny how the Red Sox became a secondary thought in the Globe. Credit to Giancarlo Stanton who had two homers in the first game of the Red Sox series and a two-run double yesterday. The best way to stop boos at Yankee Stadium is to show up in a big way against the dreaded Red Sox. Nice job, Giancarlo. This is what you were hired to do. And for all of you who wanted to cut Neil Walker, ala Chris Carter style, I think he’s given his answer to you. On a team that has featured a different hero almost every night, Walker has been a key ingredient in many of the rallies. I think there’s a much better chance of Tyler Austin finding his way to Scranton, PA than Walker hitting the unemployment line. Sorry Tyler, it’s not you. Walker has simply appeared so graceful at first base even though he is out of position and now his bat is showing why he was an offensive force for the Pirates and Mets. His veteran leadership meshes well with the team, and I am glad he’s here. Hopefully CC Sabathia can close out the Red Sox this evening and send them out of town on a three-game losing streak. Since Rick Porcello had to move up his start by a day when Wednesday’s scheduled starter, David Price, returned to Boston for medical tests, Eduardo Rodriguez (3-0, 5.29 ERA) will take the mound later today for Boston. The Yankees open a three-game set against the Oakland A’s on Friday night for their last home series before a road trip to Washington, Kansas City, and Dallas/Fort Worth. While it is cool Sonny Gray gets the start in the series opener against his former team, the player I will be watching most is former Yankee Dustin Fowler. The A’s called up Fowler yesterday. I had wondered if he’d make his season debut and first official MLB at-bat against the Yankees, but a pinch-hit appearance yesterday against the Houston Astros gave Fowler the first Major League at-bat that eluded him last year in Chicago when he suffered the devastating knee injury. Pinch-hitting for Mark Canha in the 7th inning (with Houston’s Will Harris on the mound), Fowler lined out to second. So, he’ll come to Yankee Stadium seeking his first Major League hit. While I don’t want the A’s to win (obviously), I hope Fowler gets that hit and draws a standing ovation from the Yankee Stadium crowd. He deserves it. A good man who deserves the very best life has to offer. He will always be one of my favorite ex-Yankees. Gotta admit that it is really fun to be a Yankees fan right now. I know, it’s always fun, but the World seems like a better place when the Greedy Pinstripes are winning. I was disappointed that the Yankees could not reach agreement with Dellin Betances before proceeding with the arbitration hearings. It’s never good when a player has to sit in a room to hear about his faults. It’s hard to walk away without some residual adverse impact. Once it was determined there was no common ground, the Yankees cannot be faulted for allowing the arbitration to proceed. It is just a very unfortunate situation. The Yankees, based on prior arbitration cases, were probably fairly confident they would prevail. The gap of $2 million may not have seemed to be great, but in terms of the dollars it could eventually cost the Yankees on new deals with Betances or the precedent it would have set could have been very costly in the grand scheme of things. Yet, it was absolutely out of line for Yankees President Randy Levine to gloat after the arbitrators announced Betances would be paid the Yankees offer of $3 million rather than his request for $5 million. Levine’s comments that Dellin’s $5 million request was “over the top” and “not based on reality” were unnecessary and ultimately inflammatory. If Betances had any lingering hard feelings before, they’ve multiplied. Given Levine’s extensive background in Labor Law, I am very surprised that he’d make those type of comments. The words do seem out of character for a Labor attorney. I’ve never been a big fan of Levine’s but it’s hard to dismiss his accomplishments which included work at the U.S. Department of Justice during the Reagan administration, former Labor Commissioner for New York City, and MLB’s chief labor negotiator during the negotiations for the 1996 MLB Labor Agreement. So, maybe that’s why the unnecessary words that Levine spoke yesterday hurt even more. He, more than anyone, should have known better. There was no value in attacking Dellin’s attorneys, and the long-term impact is only harmful. If Dellin eventually walks away when free agency arrives, we’ll be able to look back at this day as the first nail in the coffin. There are some guys in the Yankees executive management team that you want to keep away from talking to the media. Yankees co-owner Hank Steinbrenner is one, but you can certainly add Levine to the list. Levine has been the Yankees president since 2000 but maybe it’s time to bring in a younger, more open-minded replacement. If I owned the Yankees, I would probably promote Brian Cashman to President, Baseball Operations, hire a new general manager, and show Levine the door. Every spring, Rich “Goose” Gossage shows up and makes statements that sound like he’s been smoking too much weed in Colorado. His remarks in training camp that he cannot be compared to “one inning” closers like Aroldis Chapman and Mariano Rivera was absurd to say the least. Nevertheless, I felt Brian Cashman’s comments were perfect when he said that he had more important things to think about like drinking his cup of coffee and working on his tan. That’s exactly how I take anything Goose has to say. I loved the guy when he was the Yankees closer, and he was arguably my favorite Yankee (after the unfortunate loss of the beloved Thurman Munson). Goose is only trying to draw reactions with his words. He played during a different time, and it’s very hard to compare the challenges he faced in the 70’s and 80’s to modern times. The game has evolved. Despite nearly 500 more career innings than Rivera, Goose had barely more than half of the total career saves. Goose was a great Yankee for 6 years. Rivera was a great Yankee for 19 years. 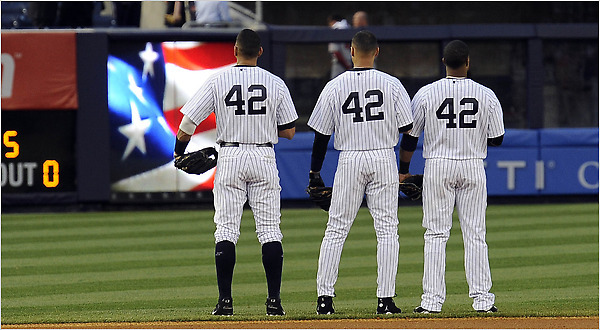 Rivera’s number (42) would have been retired even if MLB hadn’t retired the number league-wide for the great Jackie Robinson. Last time I checked, Goose’s number (54) is neatly placed on the back of current closer Aroldis Chapman. My interest in Baseball began in my childhood like most fans. I can remember NFL Football as the first sport I discovered but my passion and love for Major League Baseball started a few years later and quickly rose to favored status. I consider 1972 as the year I started following Football with close interest. That’s the year I became a fan of Fran Tarkenton and the Minnesota Vikings. I was aware of Football in the immediate preceding years, but my father died in early 1972 at the age of 42. I found the Vikings gave me something to focus on as I processed my grief. Along this same time period, I started following the Oakland A’s. In the 1970’s, they were a very colorful team with a unique owner and a collective cast of characters that were routinely championship caliber. But the one player that stood out to me was A’s starting pitcher Jim “Catfish” Hunter. As a North Carolina farmer, fisherman, and general outdoor enthusiast, Catfish had a very easy and engaging personality to go with the fantastic arm. During the 1974 season, Catfish finished 25-12, with a 2.49 ERA, while winning the AL Cy Young Award. Meanwhile, the A’s were winning their third consecutive World Series championship. I had been aware of the perfect game that Catfish had thrown during the 1968 season and it was easy to identify with him as my favorite active player. One of the very first books that I read was a biography about Yankees legend Lou Gehrig so I naturally carried positive feelings about the Pinstripers and their rich, legendary history. This set the stage for December 31, 1974. After aggressive pursuit by the majority of the MLB teams, Catfish, a free agent, signed a five-year contract with the New York Yankees. I remember feelings of disappointment that the A’s had allowed Catfish to become a free agent and could not envision myself as an A’s fan without him on the mound despite their recent history of success. So, on the day Catfish signed with New York, I officially decided to become a Yankees fan. The team had struggled during the preceding decade but my preference was to follow Catfish, even with a potentially losing team, over continuing to root for the A’s. From that day forward, I have never looked back as the Yankees have been my team ever since. After a couple of years, catcher Thurman Munson replaced Catfish as my favorite baseball player but the love of the Yankees deepened with each passing year. I will always credit Lou Gehrig for creating my positive perception of the Pinstripes, and Catfish Hunter for bringing it all together. 42 has multiple meanings for me. It is the number of years I’ve been a Yankees fan, it was the number of years my father walked the Earth, it is the symbol of one of Baseball’s greatest players (Jackie Robinson), and the number of one of my all-time favorite Yankees (Mariano Rivera). Today, December 31, 2016, I look back on the many great memories (the tremendous victories and the heartbreaking losses) the Yankees have provided, and look forward to the the bright future and continuation of the success of Baseball’s most storied franchise. Sadly, the 2013 Major League Baseball Season has come to an end. Well, at least for the New York Yankees. It was an eventful final week that saw a farewell to the great Mariano Rivera that was unmatched by any I have seen in recent years or even during my lifetime. Mo’s final game at Yankee Stadium turned out to be the final game of his professional career as he chose not to pitch during the season-ending series in Houston to preserve his Bronx goodbye as the final exit for a storied and soon to be Hall of Fame career. I have been a Mariano Rivera fan since the days when he set up John Wetteland in the bullpen. His 7th and 8th inning appearances before the cardiac appearances by Wetteland were electric. The ball seemed to come screaming with blazing speed yet Mo seemed so effortless in letting the ball leave his hand. He made it look easy, and for the length of his career, he proved he was just a little better than everyone else. Sure, there were a few hiccups along the way. A couple of key blown saves in critical games, but these were few and far between. His success rate was far superior to any failures, and in those failures, you knew that Mo had left his all. Looking back, I certainly have no regrets. It was an honor and privilege to be a Yankees fan and to witness the career of the latest Yankees legend. He’ll be someone that my grandchildren will be talking about, and I can say that I saw him pitch from the beginning to the end. Mo showed how special it was to play for one team, and he is forever embedded into Yankees lore. Ichiro Suzuki will be immortalized in Cooperstown one day as a Seattle Mariner, but Seattle will never be able to call Ichiro exclusively their own. They may have had his best years, but he still is playing his final years as a Yankee, not a Mariner. Fortunately, we never had to see Mo in another uniform or his former catcher, Jorge Posada. I have been a Yankees fan since 1974 when free agent Jim “Catfish” Hunter, then my favorite pitcher, signed with the Yankees. I had grown up very intrigued by the Yankees with their great history and tradition. Those early 70’s were still a tough time for the Yankees organization, but they were about to turn the corner following the acquisition of the team by George Steinbrenner and his partners. To digress, I always loved the quote “There is nothing in life quite so limited as being a limited partner of George Steinbrenner”. This quote is attributed to former Yankees minority owner and later Houston Astros owner John McMullen. The first baseball biography I recall reading when I was little was a book about Lou Gehrig, and I’ve been a fan of his ever since. So, when Catfish made the decision to join the Yankees, it was very easy for me to follow. During the course of my Yankees fandom, I’ve considered the following players to be my favorite Yankees. Hunter, Thurman Munson, Rich “Goose” Gossage, Don Mattingly, and Mariano Rivera. All those years and I can still count my favorite active Yankees on one hand, well until today with Rivera’s retirement. That doesn’t mean I don’t respect other Yankees over the years, these guys just happened to be my personal favorites at the time they played. Being someone who appreciates history and tradition, I’ve always felt that Rivera was the perfect man to take Jackie Robinson’s number to retirement for the final time. Mo proved that he had the character to stand with greatness, and he served the legacy of Jackie Robinson very proudly and understood its significance. I am glad that the last guy out of baseball with #42 wasn’t some thug just trying to hang on to a lost career, with rumors of a steroid past. He wears #13. Okay, sorry, I didn’t mean that, or maybe I did, but you get the point. Jackie Robinson was a great man who dealt with more adversity than any of us will ever knew. He did it while turning the other cheek and proving he was the better man. He did this while carving out a Hall of Fame career on the field. If there was a man who deserved to have his number retired across baseball, it was Robinson, and if there was a man who deserved to be the final one to walk off the field with it, it was Mo. The Baseball Gods made sure this one played out like it was supposed to. Mo, we thank you for simply being you. You did it your way, and you never strived to be anything other than what you were. You proved better than most in shaking off the game’s failures and you never gloated in its successes. You were proud of your teammates and respectful of your opponents. Baseball needs you, and I hope that this is just the beginning as you move into the next phase of your career. I am proud, very proud, when I say that I am a Mariano Rivera fan. He exceeded my wildest expectations and he leaves as the best ever at his position. He deserves to be a first ballot entry to the Hall of Fame. Anything less is unacceptable. He was ours and he proved he belongs to the Hall like no other that I’ve personally witnessed during my lifetime. Farewell, Mo. This is not the end, but simply the closing of one chapter and the opening of the next. While the focus of this post is Rivera, I would be remiss for not saying thanks to Andy Pettitte. Time and again, he stopped losing streaks and he was clutch when it mattered most (October). He never had the brilliant stuff of Felix Hernandez or Roy Halladay, but he was a winner. His passion showed and he was a champion. It was tough watching him leave via free agency for those three years in Houston, but I am glad he came back. Even during his time in Houston, you’d hear stories about how Andy still followed the Yankees. He is part of the Yankees family and history and always will be. It was so very fitting that his final game was a complete game win in his hometown of Houston. A bit ironic that the opponent was named Clemens (Paul Clemens, no relation to Roger). For the final game of the season, Roger Clemens did make an appearance to wish farewell to Mariano, and he gave Andy a hug. There has been a lot of mudslinging between the former close friends and regardless of what Roger may have or have not done, I was glad to see the small reconciliation. Baseball is greater than any one of us, and at the end of the day, Clemens, Pettitte, and Rivera were teammates and they represented the our team. I fully expect to see all three at future Old Timer’s Day games and I am hopeful that old scars can be healed and that the game itself can move forward. Getting back on track, Andy leaves the game being able to stand shoulder to shoulder with the greatest lefty in Yankees’ history, the Chairman of the Board, Whitey Ford. The Core Four (Rivera, Pettitte, Jorge Posada, and Derek Jeter) did an excellent job in reaching the pinnacle of their positions in franchise history. Posada may not have matched Yogi Berra, Bill Dickey or Thurman Munson, but he can stand in the same room. DJ is obviously one of the greatest shortstops in the team’s history (along with Phil Rizzuto). For a team so stacked in history and tradition, four contemporary players reaching the upper echelon is amazing. It is the end of a terrific Yankees era, and as much as I hate to see Derek Jeter go out with an injury filled career, I would prefer for him to leave now rather than to come back next year for what most likely will be a year of reduced relevance on the roster. The trend continues. The Yankees have played three series so far this young season, and have won two out of three in each. 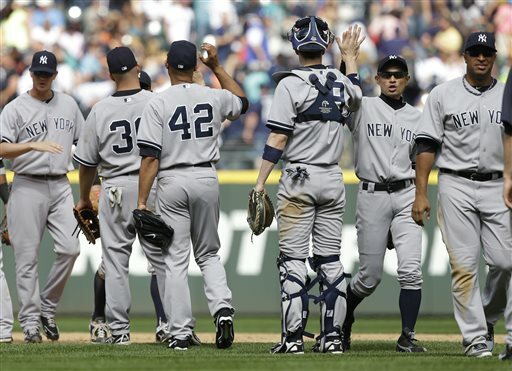 The schedule makers were very unkind to the Yankees as they pitted their top 3 foes to start the season. Fortunately, the results have been very favorable. I realize that there are many games to be played but given the Yankees are historically slow starters, at least in recent years; this season has gotten off to a great start. 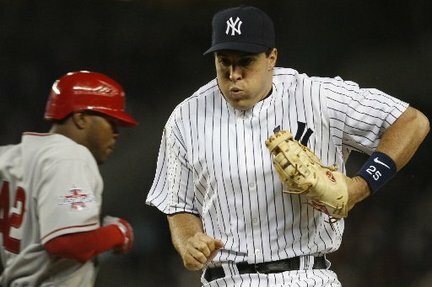 Tonight, despite an inability to get Hideki Matsui out, the Yankees prevailed against the Los Angeles Angels, 6-2. The game saw the return of Angels starter Scott Kazmir (fresh off the DL) and starter-turned 8th inning setup guy-turned starter Phil Hughes. The Yankees made it a short night for Kazmir (4 innings, 6 runs) but Hughes did struggle somewhat with his control as he gave up 5 walks and was gone in the 6th with no outs. He did strike out 6 and only gave up 3 hits and 2 runs in picking up the win. Today was Jackie Robinson Day around Major League Baseball as players honored the late Dodgers great by wearing his jersey number (42) which was previously retired throughout baseball except for those players who wore the number at the time. The last player to wear 42 in either league is, of course, the great Mariano Rivera. 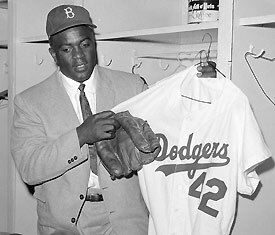 As Mo so eloquently put it, “It’s a privilege, an honor to be the last one to wear 42; it’s a blessing for me. I definitely have a job to do to represent him well.” Mo, I think you’ve succeeded. Here’s to Jackie Robinson and how he changed baseball for the better. In the grand tradition of Jimmy Curran (Baseball, The Yankees, and Life…), I recognize my ranking on the Latest Leaders List for Fan Blogs at #22 and would like to give tribute. Before I begin the tribute for the special Yankees player who wore #22, I do want to give special mention to the current Yankees #22, Xavier Nady. As you may have heard, the X Man had a MRI on his right elbow and the results were “not good”. He’ll head to the disabled list for an extended period of time and there is speculation that he could be lost of for the season. If that happens, it is possible that Nady has worn the pinstripes for the final time since he is a free agent at the end of the year. So, I would like to express sadness at the news of the injury and to thank Nady for his significant contributions to the Yankees over the past year. Whatever happens, I wish him the very best. Hopefully, he’ll take his place in right field at the new Yankee Stadium at some point in the future, but if it is not meant to be, then I hope he’ll return as a visitor, receiving a standing ovation. His arrival in the Bronx coincided with the beginning of the Dynasty years. In 1948, Reynolds headlined a starting rotation that included Vic Raschi and Eddie Lopat and that team won the first of five consecutive World Series championships. In 1951, he became the first American League pitcher to throw two no-hitters in a single season. In the second no-hitter which was against the Boston Red Sox (as Julia says, ‘Eeek!’), Reynolds had to get Ted Williams for the final out twice when Yogi Berra dropped an easy foul pop. He also won the Hickok Belt as the top professional athlete that year. He had a career record of 182 wins, 107 losses, and 49 saves (Yankees manager Casey Stengel once called him “two ways great” because of his ability to start and relieve). He won 20 games once, going 20-8, with a 2.06 ERA, in 1952. Reynolds was brilliant in the post-season. He appeared in 15 World Series games for the Yankees, with a record of 7-2, four saves and ERA of 2.79. In six World Series relief appearances, Reynolds recorded a win or a save each time, including the clinching games in 1950, 1952, and 1953. Reynolds’ career ended after the 1954 season due to a back injury that was suffered when the Yankees team bus crashed into an overpass in Philadelphia. He died in 1994 due to complications from lymphoma and diabetes. His number has never been retired and he is not in the Hall of Fame, although his accomplishments would certainly seem to justify it. The aforementioned injury to Xavier Nady opens the door for Nick Swisher to assume a full-time position in right field. It certainly solves the problem manager Joe Girardi had with finding a spot in the lineup for Swisher. GM Brian Cashman is looking like a genius for not trading either Nady or Swisher during the off-season, and so far, Swisher has been an offensive success for the Yankees. Who knows where this will lead over the course of a long summer, but I certainly feel much better about Swisher in right than I do Cody Ransom at third. For the record, Ramiro Pena made his second start at third base in Wednesday’s game against the Tampa Bay Rays. However, Ransom entered the game when Hideki Matsui pinch hit for Pena. Word is that Ransom will be starting at third base on Thursday…unfortunately. Nevertheless, back to the Nady situation, it is unlikely that the Yanks will recall Austin Jackson since Girardi prefers that he continues to get every day starts in center field at Scranton rather than riding the bench in the Bronx. More than likely, Juan Miranda or Kevin Russo will be recalled when Nady is placed on the DL Thursday. Pitcher Chien-Ming Wang altered his pitching routine between starts by facing batters while pitching from the mound at Tropicana Field rather than performing a bullpen session. Of course, he only faced one major league hitter considering that the two batters were Melky Cabrera and Cody Ransom. The Yankees win! The Yankees win! The Yankees WIN! Robinson Cano was one of the hitting stars, with a fourth inning homer that tied the game. Johnny Damon hit a game-tying double in the 8th inning that scored Derek Jeter, and then in the 9th, Jeter hit what turned out to be the game-winning run-scoring double. Mariano Rivera, in a sea of number 42 jerseys (in recognition of Jackie Robinson), easily retired three Rays batters to end the game. So, a series that started so poorly, ended on a strong note.